Visit TG Farms in Norman this fall to pick from a large selection of orange pumpkins within the farm's famous pumpkin patch. After you've chosen the perfect pumpkin, explore the 10-acre corn and hay maze for a memorable family adventure in a fun, safe environment. Family owned and operated, TG Farms also offers tasty treats at their general store where visitors can find salsa, vegetables, preserves, pickles, relishes and more. 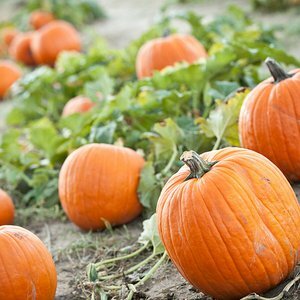 Browse through fall produce and decorations including straw bales, corn stalks, gourds, decorative corn and a sea of pumpkins, or enjoy petting farm animals and taking a hayride. Before your trip, please call ahead for information. Seven days a week: 9am-dusk. Open seasonally from mid-September to early November. From I-35, take Exit 106. Go 1 1/2 miles west on Hwy 9. Located 1 mile past Riverwind Casino on north side of road behind fire station.